« Get Results – Complain Online! I had the honour and pleasure of being one of the judges at the Cork Schools Enterprise Finals at CIT in Cork this month. This initiative was sponsored by Cork County and City Enterprise Boards. It basically consisted of transition year students starting a business and running it as a project as part of their development. In my section I was judging the City entrants with Natasha Lynch from Essential French and we had 6 good contestants to review. It was a pity there weren’t more entrants from the City but I guess the schools are quite busy these days – I would recommend it to any school as it seemed like a fabulous experience for all of them. It was incredible meeting these enthusiastic students, who showed us their business plans, their ideas, their “inventions”. They shared with us their real-life experiences including “power struggles” and disagreements, disappointments and successes along the way. They poured their energy into all of their projects and already you could see how these unique experiences will stand to all of them. 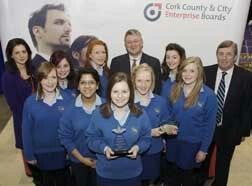 To all of those students, their teachers, CIT and the Cork City and County Enterprise Boards – I salute you! To the winners (which from my point of view was everyone who participated and learnt valuable life lessons) well done guys, you deserved it. To the guys from my old school Spioraid Naoimh, keep up the good work – next year you might be in the prizes! This entry was posted on March 29, 2010 at 7:51 pm and is filed under Marketing. You can follow any responses to this entry through the RSS 2.0 feed. You can leave a response, or trackback from your own site. I agree with you 100% Greg! their enthusiasm was fantastic! Best of luck to Christ King Girls who will be heading to Dublin at the end of April to represent Cork City in the Regional Finals! Bonne Chance!